A total of 17 provincial public security chiefs from 13 provinces in China have been replaced in the past month. It was the biggest reshuffle that has been done by Chinese Communist Party leader Xi Jinping in the political and legal scene since 2013. It is believed that Xi is preparing for the reorganization of the politics and law system, and ultimately the arrest of his rival, former Party leader Jiang Zemin. 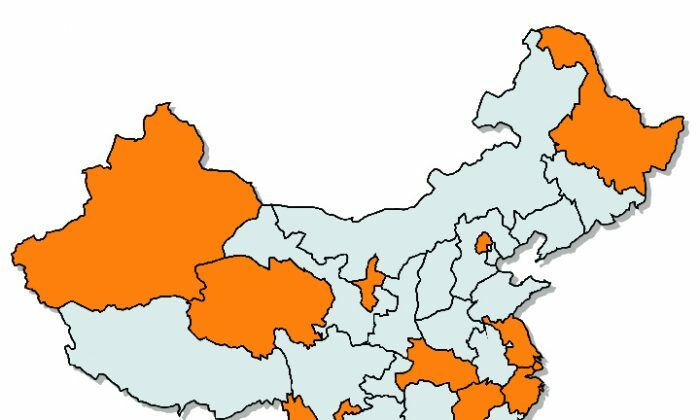 According to a recent article in a CCP mouthpiece media, the provinces affected were Beijing, Shanghai, Zhejiang, Jiangsu, Guangdong, Hubei, Heilongjiang, Yunnan, Guangxi, Jiangxi, Qinghai, Xinjiang, and Ningxia, with Zhejiang seeing the biggest upheaval. The entire public security organ in Zhejiang was reorganized within a week. The Procurator-General and Chief Justice of Beijing were also replaced. Most of the people who were replaced had assumed office in 2008. Ever since Xi announced on Jan. 12 that his anti-corruption campaign was having a landslide victory, there has been a lot of reorganization in the public security system. Starting from Jan. 13, in just 10 days 11 chiefs were removed from office. The officials who were removed belonged to a group that shared common interests. They helped and covered up for one another. The meeting of Public Security Department heads, the Procurator-General meeting, the Chief Justices of the Supreme People’s Court meeting, and the Department of Justice meeting were all held on Jan. 23 in Beijing, and all the new heads pledged their loyalty to Xi. Individual commentator Li Shanjian said the officials who were removed belonged to a group that shared common interests. They helped and covered up for one another. As a result, Li said, there was nothing the system could do to them. Deployment on a large scale and replacing old staff would undermine the original system and make things easier in the time to come, Li believes. This has been the biggest reshuffle in the public security system since 2013, when 20 chiefs in the public security organs were replaced. At a political and law meeting held on Jan. 20, 2015, Xi stressed the importance of having a full grip on the “knife” (the political and legal system). The reshuffle shows that he is gaining full control of the system. Commentator Xia Xiaoqiang thinks Xi is taking control of the “gun” (the military) and the “knife” to prepare himself for the arrest of Jiang. In the political power structure of the Party, the “gun” and the “knife” are two important factors in determining political stability. Xia feels that the purging of the chiefs of the political and legal system is as significant as the military reform, and they will ultimately lead to the arrest of Jiang. Translated by Su Lin. Written in English by Sally Appert.